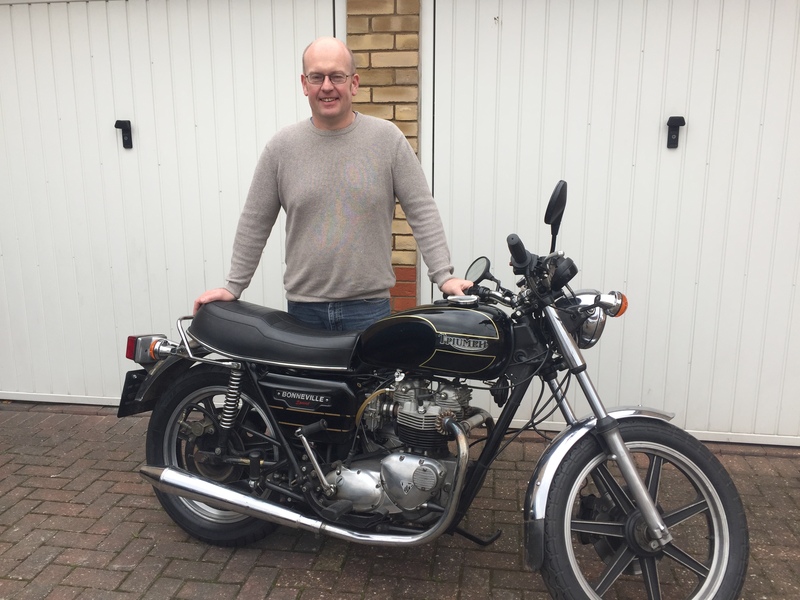 After searching the internet for a genuine Triumph T140 to buy and enjoy, I was beginning to give up hope of finding the bike of my dreams, then I found Meriden Motorcycles. 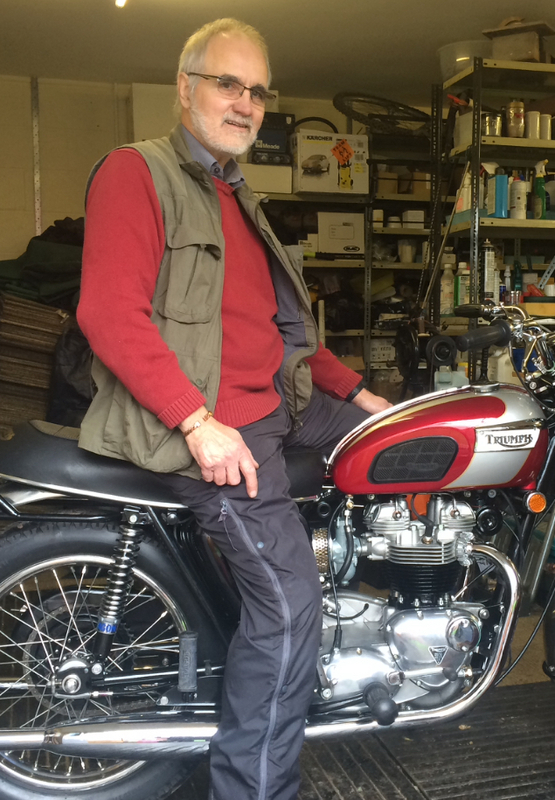 A phone call later, I was filled with joy after speaking to John, who has a vast knowledge of Triumph motorcycles. He invited me to his workshop to view a T140D he had for sale. When my wife and I arrived, we were greeted with a cuppa and a chat about Triumphs, then we had a look at the T140D which I fell in love with instantly. 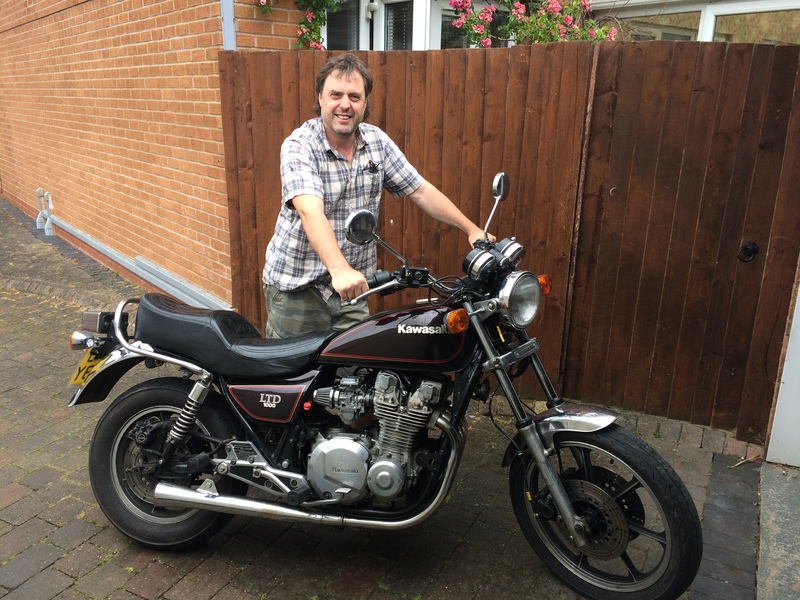 We had a deal that John would deliver the bike to me at a later date, only to be amazed of having the bike delivered two days later and being serviced also… Fantastic! Thank you to John for all your help and friendly advice. After making a return to bikes after 34 years I treated myself to a Triton, only to spend the next year trying to get it to run right. Thoughts of selling it cropped up and I decided I needed to get it to a specialist. I had heard of Meriden Motorcycles, had a look at the web site and made a phone call. John was most helpful and understanding he told me to bring the bike over and he would have a look at it when he could. With their busy workload I was not expecting to hear anything for a while, but in no less than 2 weeks I got a call from John to say the bike was complete. He told me to bring my helmet so I could take it for a spin up the lane to make sure I was happy. And boy was I happy; the smile on my face was so wide I couldn’t get my helmet off after the test ride. The bike has never run so well. A real workshop with proper blokes and proper spanners ! No unnecessary work done just a sensible approach to do what was required. The bill was a pleasant surprise as well. As you can see from the photo they make a good brew as well. I can’t thank John enough and when I next need some work doing I shall be beating a path to their door. My T140v was in need of mechanical restoration, browsing through the web I found Meriden Motorcyces and what a find. On contact with John I was very confident that I was in good hands, I wasn’t disappointed. I was very well advised about the process, I was kept informed throughout and given options on what course to take when problems arose. The work was professional, John was a Triumph engineer at the original factory so he knows your bike from top to bottom, the cost was very reasonable. If you want a straight forward, honest professional service, Meriden Motorcycles is the place of choice. I fully recommend. I went out on her yesterday and had a great time apart from a bloody bee sting, only the second one I’ve ever had, cheers John. We are very pleased with the service you gave us. We love your premises and set up, and the informality. More like chatting to a friend, and given every confidence that we can get the work done well and surprisingly quickly. We knew you are very busy, and didn’t expect the engine rebuild you did for us to be so quick. So that was a bonus. Thanks again. Hopefully see you soon with a complete bike!!!! 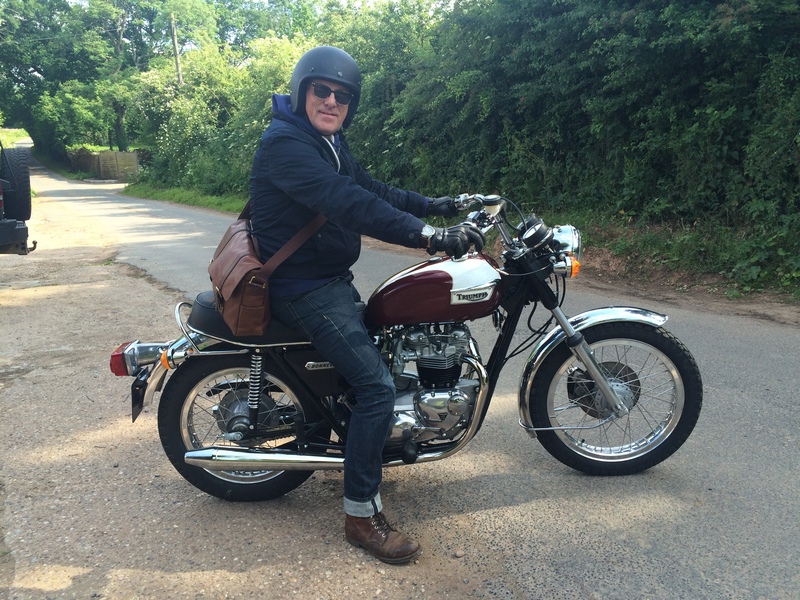 I’ve had the Bonnie since 1979, and it’s spent the last 30 odd years in the shed. Both it and I have been out of it for decades – the usual story of career and family taking precedence. After a few years’ retirement, I decided to have a go at refurbishing it. I decided from the outset that it wouldn’t be a full restoration of absolutely everything: I wanted a clean, working bike that was mechanically up to scratch. It would be be a mixture of me and specialists, so I looked up a few of them up. 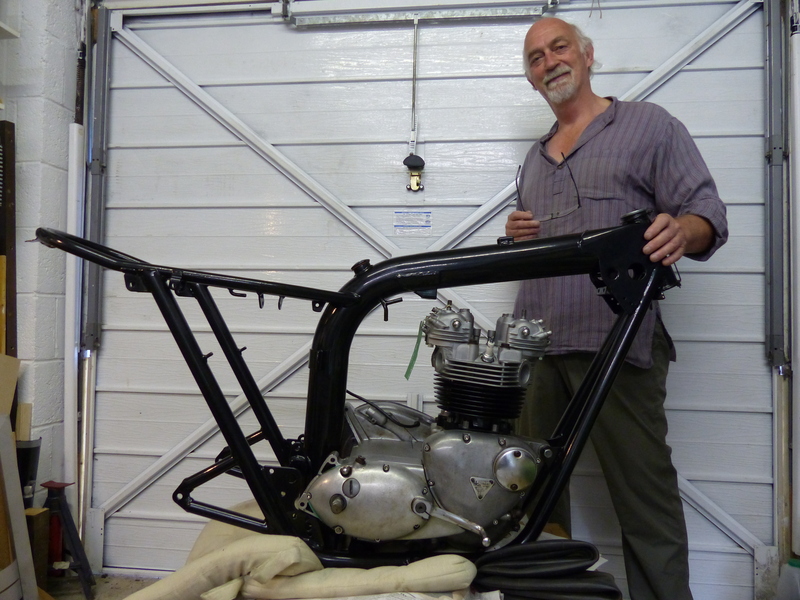 Meriden Motorcycles caught my attention, because of the engine rebuild specialty and because the website testimonials pointed towards a flexible, relaxed and grounded approach. Having now dealt with them, I’m happy to add my commendation to the others. I reached a stage with the T140 engine where I couldn’t get any further – the barrels wouldn’t move, likewise one or two other bits, so I contacted MMC, explained the situation to John and arranged a visit, complete with engine. 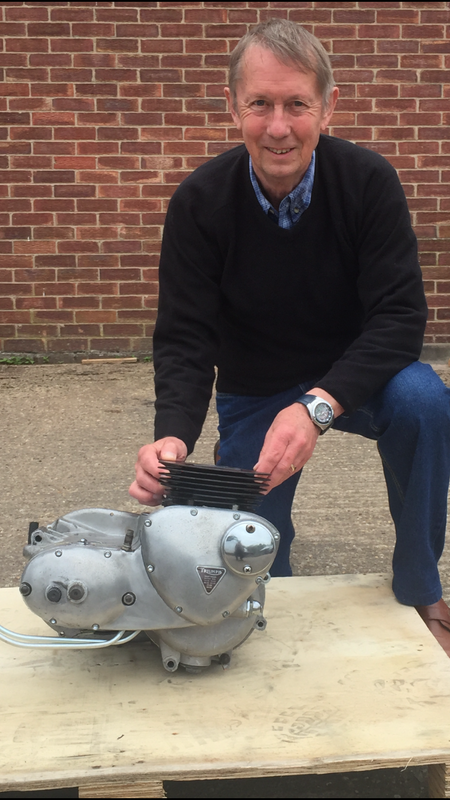 We began by having a cup of tea and a relaxed hour long chat about the engine – him gauging how much (or little) I know, and what I wanted done, and me picking his brains and asking his advice and opinions. We eventually agreed on a rebuild to standard on the understanding that he would let me know if there was anything alarming, but otherwise to carry on. He sent regular emails and photos to keep me informed and to let me know of anything untoward. “Any problems, or advice needed, get in touch.” The eventual cost was less than the estimate. Having struggled to get the engine out of the frame, I wasn’t keen to try and put it back in, so I took the frame to MMC for steam cleaning, coating and fitting the engine. Again, all completed with no fuss or pressure, and at what I thought was a fair price. Seeing the rebuilt engine in the refurbished frame was a real buzz. No doubt at some stage down the line I’ll need some more specialist input, and in that case I won’t hesitate to get in touch with John and MMC again! 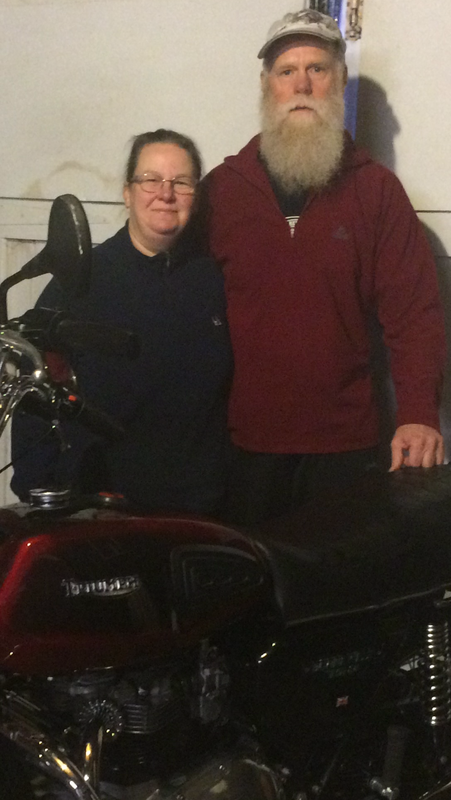 Hi John, it was great to get my bike back today, what a fantastic job you have done. 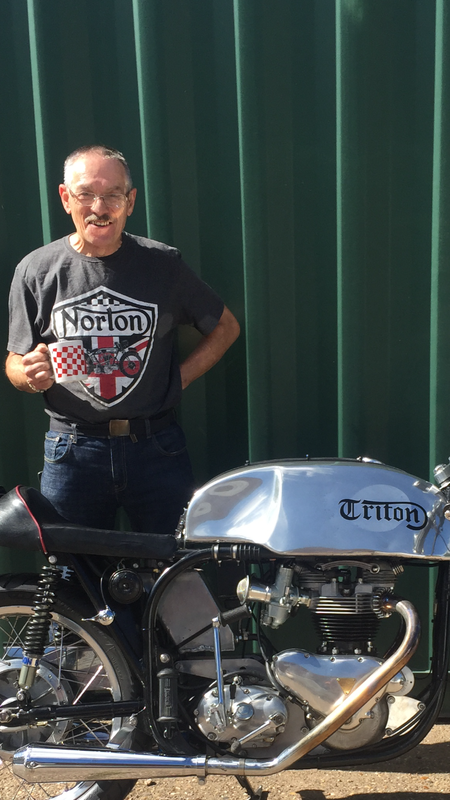 I have not heard my Norton run so well for ten years, I look forward to using you for any other work I need on my bike. Thanks again, all at Meriden Motorcycles. Just collected the bottom half of my Triumph 5TA engine, after a full overhaul at Meriden Motorcycles. Now it is time to finish the bike rebuild myself. I cannot speak highly enough of the work done on the engine and John kept me informed throughout, providing updates by phone and photos.The reasonable cost was within estimate, which was amazing as he didn’t know exactly what he would find. Their expertise and enthusiasm regarding the overhaul has been great and their friendly, helpful manner was much appreciated. 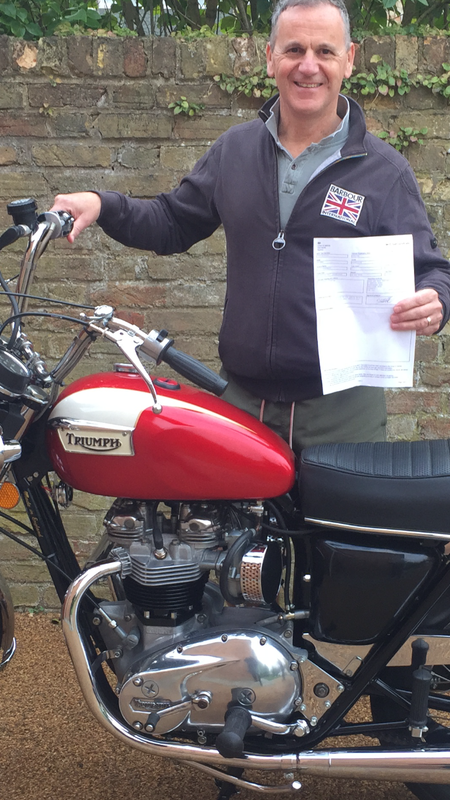 I needed some work doing on my 1971 Triumph, following an advisory note on the recent MOT and after looking at the manual, I realised it was a 4 handed job and likely to be beyond my mechanical abilities. 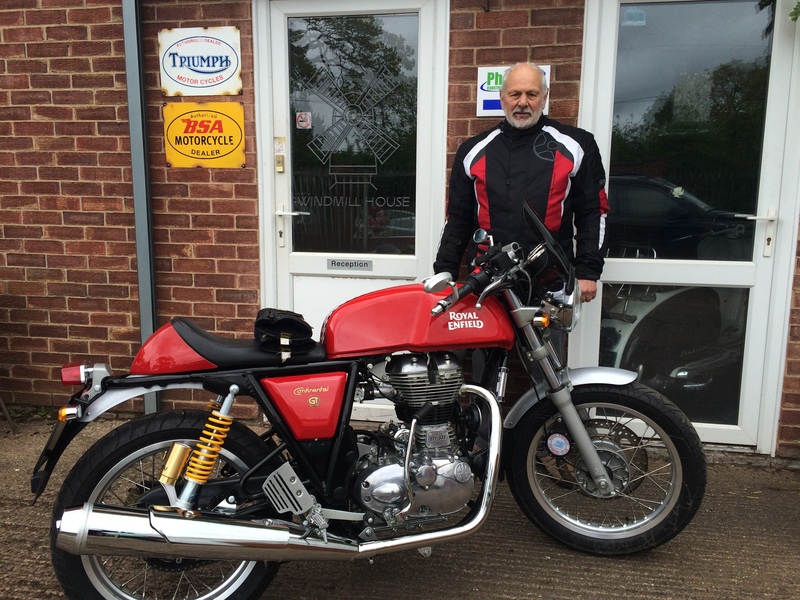 I’d been to Meriden Motorcycles for a look round a few weeks ago and they have lots of experience with Triumphs, having many in various states of repair around the place. I discussed the job with them and they said what was required, how long it should take and quoted a price which seemed reasonable for what was needed. The bike was dropped off the following week and John gave me a lift to the station so I could get home more easily. They phoned 2 days later as agreed to say the job was done, on time and under the quoted price. I went to collect it and the whole episode was more expensive than planned as I spotted a 1981 T140E that had just arrived and I decided I’d quite like. We did the deal over tea and chocolate biscuits and the bike was delivered the following week. So, an unexpected change of bike and a shop I feel confident in using and recommending. Jon and John both know their Triumphs and I would be happy to trust them with anything mechanical I may need help with in future. In short, a proper shop with friendly staff, good customer service and a decent mug of tea. 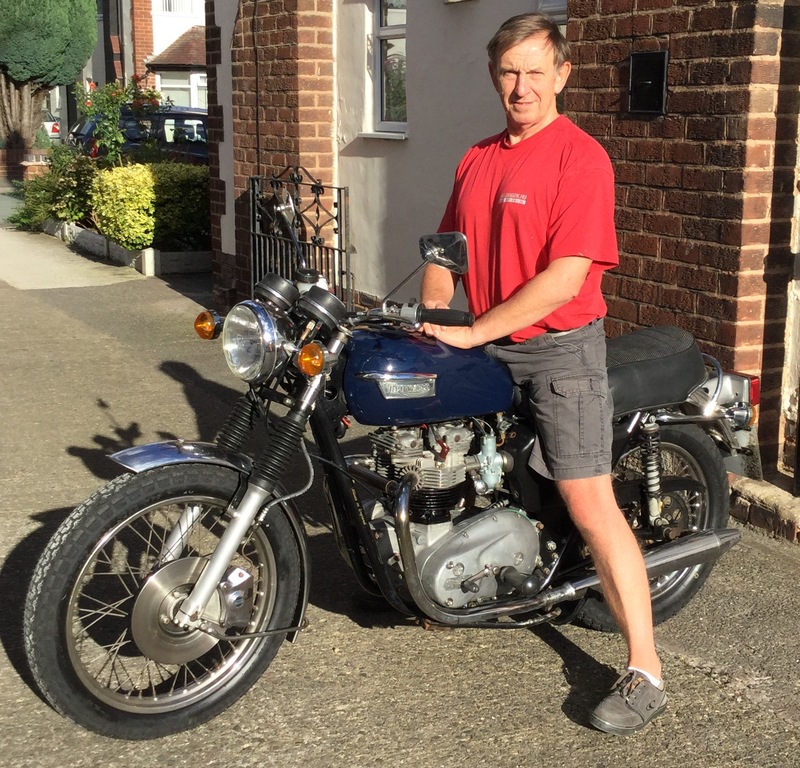 I’ve owned my 1969 Triumph Bonneville since 1983. In the spring of 2014 I was having serious problems with her and to cut a long story short, I decided to seek help. This is when I came across Meriden Motorcycles; I gave them a call and spoke to John who listened to my tale of woe and offered his advice. A few months later I travelled up to meet both John and Jon to discuss my requirements further. After agreeing the scope of the work, which included a full engine rebuild (and a few other bits), my bike was booked in for summer 2014. Whilst the bike was away I was kept fully updated with a series of emails, photos and finally a video clip showing the bike running! My Bonnie was returned to me in September 2014 and I was truly delighted with her and the work done, all completed within the price we had agreed. A year later I returned to Meriden Motorcycles to have my Triumph serviced and MOT’d together with some work on the front end. Again l was very happy with the work done. I am now having great fun riding my T120 thanks to Meriden Motorcycles who provide an excellent, friendly and knowledgable service. Their approach is both sensible and practical, geared to the customer requirement. 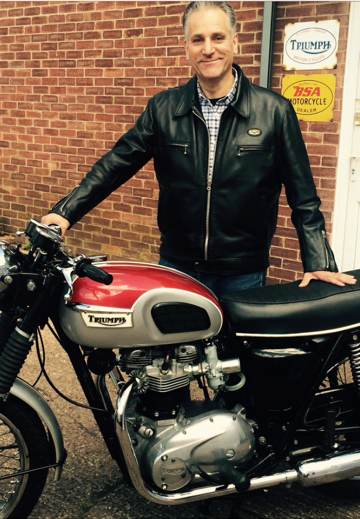 I’ll be booking my Triumph in for it’s 2016 service and MOT later in the year. I’ll be the first to admit that a 210 mile round trip isn’t exactly just round the corner, but I enjoy the ride up via the A5 (and the Super Sausage Cafe) and when you arrive John never fails to put the kettle on. It makes total sense to me! This bike has taken nine years of work to restore, however, I struggled with the final setting of the timing and carburettor. I decided I needed help. 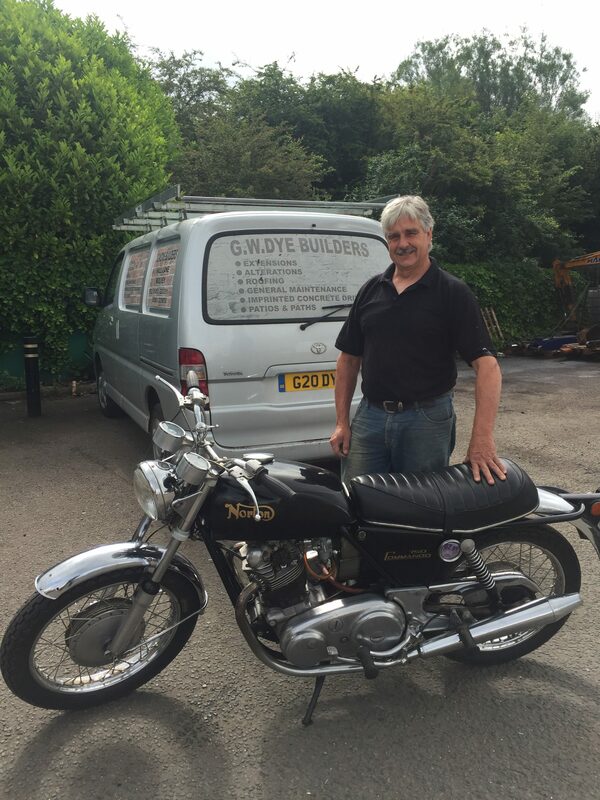 After initial enquiries with like minded enthusiasts, Meriden Motorcycles came highly recommended, one phone call later they were extremely helpful, picking the bike up within two days. Just two days later this bike has it’s first MOT in nine years and runs sweet as nut. They also demonstrated how to kick start and pull bike back on to the stand (which couldn’t before, however hard I tried). I was going to sell this bike after becoming very disheartened. Not now , she is running fantastic all this due to the experience of the Jon and John at Meriden Motorcycles. This recommendation speaks for it self. The fault was beyond me, and nobody else wanted to take it on. Saying it was too difficult or too time consuming. However you did, and now I have a bike running how it was in 1983! 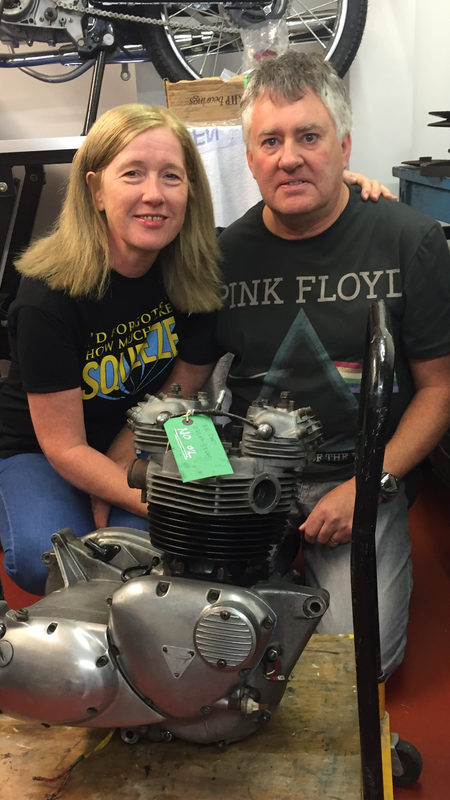 I think it was back in September of last year, the guys at Meriden were doing some work on my T140 Bobber, I mentioned to John the story of when I first got into Triumphs. 1981 Abbey garage in Uxbridge had a collection of Triumphs, I remember actually going with Dad to sign the papers for the hire purchase, he actually needed to sign as I didn’t have a credit rating, It was a great day, I still remember it like yesterday following him home, finally I have decent bike, I went every where it was my only form of transport, I told John it would be great to live that feeling again. Sharing the story with John, I went through what I could remember, the bike was the red and cream, US spec, right hand shift, P Reg, I think that was a 1976. John in his usual educational style “must of been a 74 as they didn’t make right hand shift in 76” well excuse me Professor Triumph. John asked me if I would be interested in looking at a right hand shift, he takes me in to the back where he shows me this pre loved 74, in a right mess, he said I could get the same as the one you picked up in 81. Six months later here we are good as new, as I rode away from the shop down the country lanes towards Warwick, grin factor must have been at the max, thinking back to that day back in 81 at Abbey Garage. I must say it was a real pleasure working with guys that really know what they are talking about and give you the confidence in what they say they will deliver. John kept me updated with emails and photos during the build, we agreed on a price before the work started and he came within budget, anyone thinking of buying, restoring or just having some work done, don’t even consider going any where else. Great service and enjoying the bike immensely. I would recommend you give them a try. 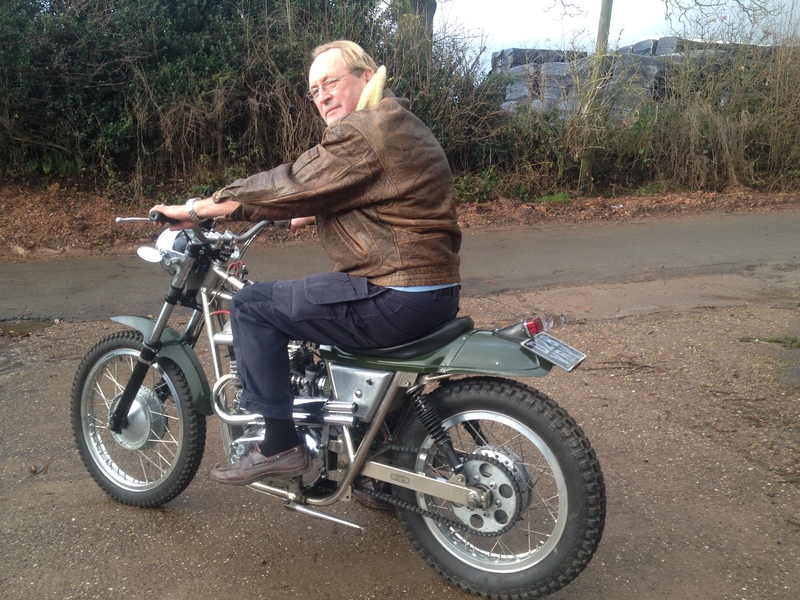 Hi guys, just to say that the work that you carried out to retrofit an electric start to my Triumph Metisse is first class. The bike starts first push of the button, every time. All who have seen the installation have had more than favourable comments. I have recommended you to all of my friends and colleagues with classic bikes as I am positive they will all be thrilled with the standard of your work. I am willing to speak to any potential customers that would like to have feedback of my experience with Meriden Motorcycles.